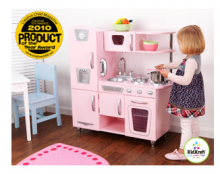 *HOT* PINK KidKraft Vintage Play Kitchen ONLY $99! I’ve been pricing kitchens all evening and guess what’s back! This is one of the hottest deals I’ve seen if you are looking for an awesome play kitchen for your toddler. You can get the Pink KidKraft Vintage Play Kitchen right now at Walmart.com for only $99 $115.97! It looks like the white is gone but now you can get PINK. Don’t forget to look at all the colorful kitchen accessories they have on sale too! Use â€œSite to Storeâ€ and shipping will be FREE too! Or if you’d like it shipped directly to you, standard shipping is less than $6. To give you an idea of what a good deal this is, this exact white kitchen is still selling or $128.99 on Amazon. So this sale linked above from Walmart really is a great deal!